RIO Video Productions is a Texas limited liability company and state certified as a small, minority business. RIO is a high quality and award-winning video production facility based in San Antonio, Texas. We specialize in video taping, video editing and DVD duplication services. We are a full line San Antonio video production company that offers the best in script writing, story boards, on site productions, event video taping, post digital video editing, directing, producing, marketing business videos, sports production, news production and wedding videography. We offer mass DVD duplication services for video projects. RIO Video Productions are experts in education videos, marketing business videos, event presentations, sporting events, advertising, tradeshows, company training presentations, legal depositions, real estate and family weddings. RIO Video Productions provides informative and entertaining marketing business videos, documentaries, wedding movies, DVD video taping, video production editing, and virtually any type of event video taping. We have video production clients throughout Texas in cities including San Antonio, Dallas, Houston, Corpus Christi, El Paso and Harlingen! 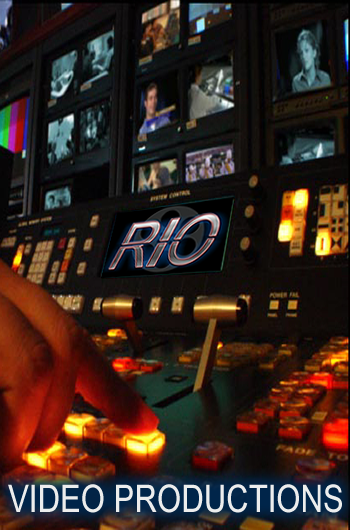 RIO Video Productions San Antonio provides a high end product at competitive costs! We make it a point to work closely with each client to meet their production and budget needs. We are story tellers for video production Texas and offer the best in San Antonio video production and DVD duplication services! When it comes to videography, RIO Video Productions is a leader!